What Day Of The Week Is September 22? 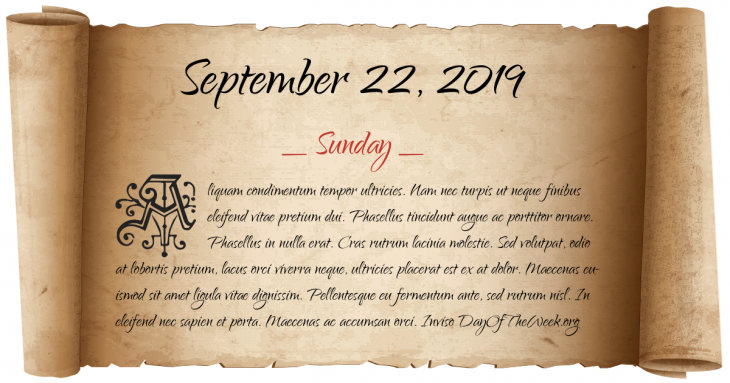 September 22, 2019 is the 265th day of the year 2019 in the Gregorian calendar. There are 100 days remaining until the end of the year. The day of the week is Sunday. Battle of Curupaity in the War of the Triple Alliance. The independence of Bulgaria is proclaimed. Spanish Civil War: Peña Blanca is taken; the end of the Battle of El Mazuco. A barge strikes a railroad bridge near Mobile, Alabama, causing the deadliest train wreck in Amtrak history. 47 passengers are killed. the Nordhordland Bridge was opened across the Salhusfjorden between Klauvaneset and Flatøy in Hordaland, Norway. It has no lateral anchorage because of the depth of Salhusfjorden. Who were born on September 22?